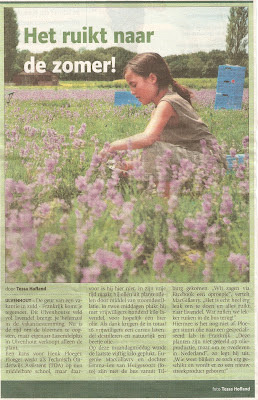 In 2012 I wondered what is the difference between lavender oil from plants grown in Nederland or, for example, in France. Is this oil less in quality, or different, or has it its own specific characteristics? To find out I picked with help of enthousiastic volunteers in 2012 and 2013 lavender. Plants growing in Ulvenhout and Chaam in the Nederlands. Through steam distillation process I made lavender oil. I needed big amount of lavender to harvest. It was made possible by one of my contacts which is a greenery of lavender nearby. And where I in 2011 had already harvested a modest amount of lavender flowers and stamps, and I distilled these lavender plants. Based upon the scent and smell of different species of lavender I chose Lavandula angustifolia var. little Lady for this project. Little Lady is a cultivar which is been grown in about three years time from little seedling till big potted plant. During breeding these plants needed to be pruned on a regular base for several times. Due to management of the greenery the cuttings stays on the soil after mowing. These valuable resources I could harvested myself with help of our volunteers. The harvest took place during blooming and flowering of lavender plants around the end of June, start-July. The exact time of harvesting depends on weather conditions. 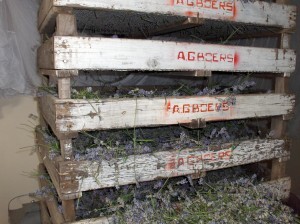 We did harvest in both 2012 and 2013 a reasonable amount of 100 kg lavender. 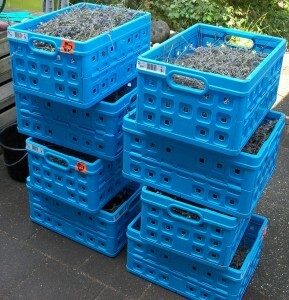 We did the harvest during two sessions in the afternoon. The amount of harvested lavender was limited to the drying trays capacity I could relay upon. The number of volunteers and their enthousiasme was stunning; we even had to turn down a few volunteers because we were only permitted to work with maximum eight people at the same time on the field. The onrush of volunteers in 2012 was partly explained by a nice newspaper article in BNdestem about this activity. In exchange for collaboratory work on this project the volunteers were offered a free workshop on distilling lavender. 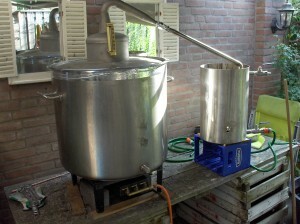 I estimated that 100 kg of flowering lavender top-ends would be sufficient to distill about 1 liter of lavender oil. For drying this amount of lavender I used drying trays one could easily pile up. I had capacity for about 50 kg. Drying lavender plants before distilling is not necessary, but has to do with the content capacity of my distilling kettle or still. For each separate distill I putted four full crates of lavender in the still. Which is the same amount of 16 kg just-picked lavender. 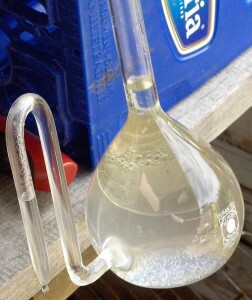 During distilling I used a so called ´Florentine vase´ to separate hydrosols and oil. 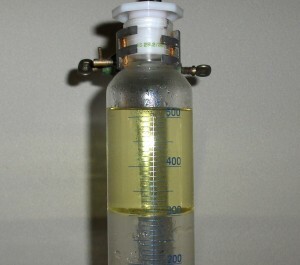 When just started the distillation, the oil is almost without any colour, but changes to a more yellow shade. 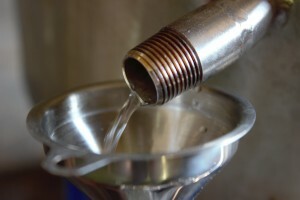 The scent of the oil develops during this distillation process also. The first distillation of the harvested lavender in 2012 took about 2,5 hours and provides 140 mL essential oil and 7 liter of hydrosols. So 16 kg lavender has a yield of 0,88%. After the whole distillation process in 2012 I had a yield of 0,8 % which is equal to 800 mL lavender oil. In 2013 I could from the same amount of flowering lavender tops (100 kg) distill 1 Liter of lavender oil. This time the yield is 1%. Due to weather conditions and perfect circumstances for picking. The rate of sunlight received by the plants during a couple of days before harvesting is crucial to influence the production of oil within the plant. To test this assumption in 2013 I distilled a part of the harvest from 4 July and 8 July in separate batches. The harvest on the 4th of July was preceded by several rainy and cooler summers days. The weekend after that one it was warm en very sunny summer days. 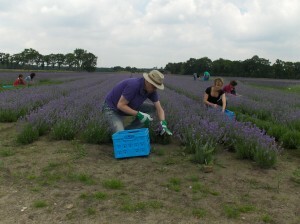 On the 8th of July there were excellent conditions for harvesting lavender. The results you can see below are clear about the fact that the yield of this harvest was almost 10% higher. 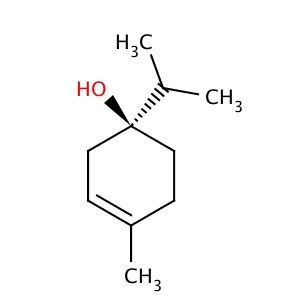 Significant in this analyse is that the essential oil of lavender produced in 2013 sufficient to iso-norm concerning the amount of linalol and linalylacetate. Second fact is in this oil from both 2012 and 2013 is a high percentage of terpineen-4-ol . What does this analyses research tell us about the quality of dutch lavender oil? 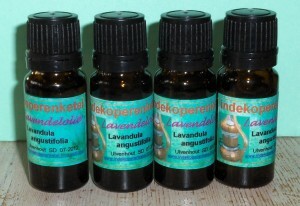 Looking at the composition of dutch and french lavender oil of Lavandula angustifolia, the scent will be different. Analyses research shows that the dutch oil has an unique character. This will also tell something about the therapeutic value of this lavender oil. I asked Madeleine Kerkhof-Knapp Hayes of De levensboom to look at a total spectrum of this oil. It’s important to look also at components which are very low in quantity because they can be of great value for therapeutic use. Indeed, linalol and linalylacetate are poorly but by the bigger quantity of terpinen-4-ol it shows a significant fungicide activity. 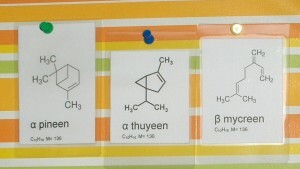 Don’t forget the strong purification influences of ocimeen. A fairly good oil to apply in making of soap indeed, but I think that this oil has also a calming effect. Because of the presence of myrceen. I would use this for wounds, skin infections, acne and pain release. That was wonderfull news! In 2013 the amount of linalol and linalylacetate was within norms. We had made a lavender oil which as even more suitable to apply on even more diseases by the fungicide effect. A superproduct for aroma therapist. You can congratulate the distillator with this beautiful result. It’s a lavender oil of supreme quality. 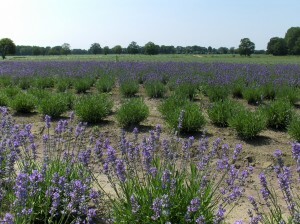 A part of lavender oil I produced in 2012 is used in production of soap by werfzeep in Utrecht. Werfzeep works only with certified organic oil to make their soaps. For the production of lavender soap they used olive oil, coconut oil and cocao butter. These oils ara saponified with caustic. After this process the lavender oil and colouring are added. The colouring is an extraction of green alkanet. This red pigment changes during the process of saponificition in a beautiful lavender purple. Besides the components and their function of lavender oil I also wanted to know if there would be any pesticides in this oil. 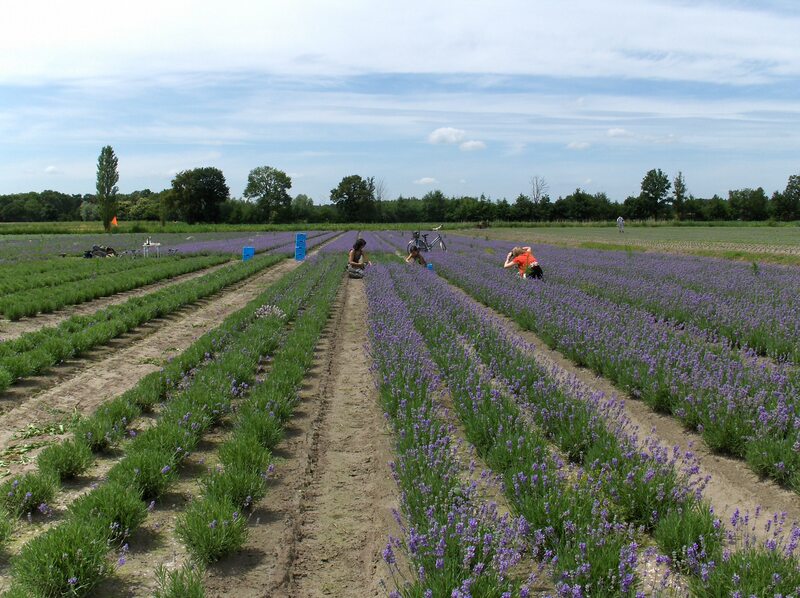 In 2012 when we harvested on a field in Ulvenhout, this was not the case, but the results on chemical tests of lavender oil from Chaam contained a very low percentage of hexachlorobenzeen(fungicide) and pentachloroanisole. The values were just detectable within the range of 0,01 mg/kg oil. This was a moment of disappointment, after the good results of 2012 where no pesticides were found. The concentrated pesticides was 3000 times beneath the most severe norm. I asked aroma therapist Madeleine Kerkhof-Knapp Hayes of De levensboom to give me advice how to use this oil. She advised to use this oil not directly on the skin or inhalation. But vaporasion in a room can be done. Despite the fact the oil measured within the most severe norms, I decided in 2013 not to sell this lavender oil, because I want to sell a pure organic product. One can speculate about the origin of those two pesticides on the field. It could be that the field in Chaam by growing all kind of vegetables during the years has been contaminated with pesticides more than the field in Ulvenhout. 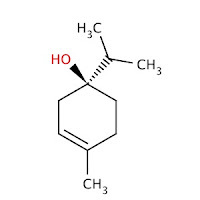 A product like hexachlorobenzeen could be an indication, because this product is already on a list of prohibited pesticides for many years. These kind of pesticides are polluting through the soil the plants and are extremely well adapted by oily components. That’s why they end up eventually in a high concentration in essential oils. This lavender project has provided me a lot of information about the components and use of essential oils made from lavender plants grown in Nederland. More than sufficient to motivate and inspire people to grow organic lavender on clean soil. The Dutch lavender oil has a very specific composition and can be measured in quality by, for example, French lavender. The lavender project I worked on with so much fun, together with Catharina, and so many enthousiastic volunteers was really worth doing this experience!